According to Forrester Research, between 70% and 75% of a typical tech budget goes to keeping the lights on and the business running, even if there are no new projects. 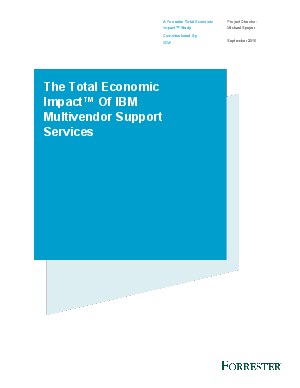 IBM commissioned Forrester Consulting to conduct a Total Economic Impact™ (TEI) study and examine the financial benefit the organizations may realize by deploying IBM’s Multivendor Support Services (MVS). MVS provides hardware maintenance support to a wide range of non-IBM devices like servers, storage, and networking equipment that are out of original equipment manufacturer (OEM) warrantee or are approaching end of life. The purpose of this study is to provide readers with a framework to evaluate the potential financial impact that MVS may have on their organizations.